The Sinag-Tala Dance Troupe was established in 1972 as the signature cultural extension of the Filipino Association. Since then it has actively performed at community events, cultural festivals, schools, churches, and private functions throughout Kansas City. The original founders have passed on the responsibility to preserve and promote this part of Filipino culture to a new generation of young dancers. March 19, 1972 is recorded as Sinag-Tala's conceptual date. The name is so apt as it means "starlight," in Kansas City a name associated with art, music, and entertainment. Mr. Manny De Leon, (a former Bayanihan dancer) was Sinag-Tala's original artistic dance director and choreographer par excellence who provided the leadership and dedication to teach a novice but eager and spirited group of ladies and gentlemen. Many of them were nurses, medical technicians, and doctors who kept their day jobs. Manny disciplined and molded the young dance company as cultural ambassadors of Filipino Association of Greater Kansas City. Sinag-Tala was the showcase to exotic and exciting Filipino culture. Dance concerts, cultural festivals, fashion shows, and special invitations became a way of life for the dance company. Sinag-Tala was the cover story of Kansas City Star Magazine on November 26, 1972 – a time when we knew only half of our repertoire. Soon we knew we had to perform what we posed for. Fiesta Filipina for fours years (1975-1978), Festival Asia for two years (1979-1980), dance concerts on our own (1973, 1974, 1976, 1981) and with the Missouri Dance Company were the highlights during the first decade. After Manny left, returned briefly and then left again, he left a void in Sinag-Tala in the mid 1980s. Fortunately, he left behind a core group of dancers who lived by his teachings. An emerging core of dance directors were called on to lead the group. We survived the second decade, and continued on with a series of dance directors who were his pupils – Gemma Alemania-Snyder and Sam Aquirre (who are now the choreographers for the group). Arnie and Shirley Sulit have been executive directors since 1992, and have shown a commitment and dedication to Sinag-Tala undiminished since it was started thirty five years ago. The Filipinettes, a former subgroup of the Sinag-Tala, began in 1977 by Mila Tiojanco when she oraganized the "little ones" for the Fiesta Filipina. Assisted by a Sinag-Tala dancer, Ami Ubalde, they later blossomed into members of Sinag-Tala representing the second generation of Filipino-American dancers. They went into a long hiatus until the group got resurrected by the Sulits, as more preteens and their parents got interested in the Philippine dances. The former Filipinettes are now very active and has become training ground maturing into Sinag-Tala dancers. They easily steal the show during their performances through the display of their infectious enthusiasm. The current Sinag-Tala dancers insist and persist on their Sunday rehearsals. Sinag-Tala take pride in their culture. The dances performed by the Sinag-Tala show the influences of different regions of the Philippines. They are divided into four main suites: the Northern, the Spanish Colonial, the Muslim, and the Rural Suites. The Northern Suite covers the dances and ceremonies from the north-central part of the Philippines. Male movements are characterized by aggressive gestures and stances. The women, on the other hand, carry themselves with regal serenity. The dances of Spanish Colonial Suite are of Hispanic influence and are affectionately called Maria Clara, after our national hero Jose Rizal's ideal of modest womanhood. Female dancers are dressed in satiny, flowing gowns, and the male dances are dressed in barong tagalogs. The dances of the Muslim Suite are those of Muslims in the southern island of Mindanao. Strong percussive rhythms of the gongs stress the angularity of the precise movements. The head is turned to the side, accentuating the profile of the high cheekbones. The arms are extended to the sides, but with the wrists flicking upward at an angle. The Rural Suite shows a panoramic view of the Philippine countryside, celebrating the bayanihan spirit. Harvest time is fiesta time, as young children celebrate nature's bounty. 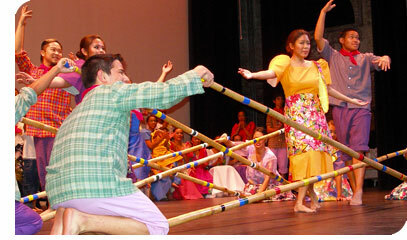 In the tinikling (named after the long-legged bird of the rice paddies), the dancers jump over percussive bamboo poles as vibrant rondalla music plays in the background.